Christmas can be a hugely demanding time on our calendars, and between staff parties, family gatherings and catch ups with friends it can seem like you’re permanently out on the town. While it’s great to join in the yuletide fun, too much fun can have damaging effects on your health and before you know it you could be spending your holidays with an aching stomach and lying in bed with a food or drink hangover. It’s quite common for people to over-indulge at Christmas when they don’t monitor their drinks, they don’t eat right, and they don’t ensure they stay hydrated with water. There are certain rules that one should follow when enjoying a night on alcohol. Eat first - Having food in the stomach slows the absorption of alcohol into your blood. This reduces the amount of alcohol that reaches your brain, and gives your body more time to process the toxins. An added bonus is that having eaten a good meal, you’re less likely to end up in the late-night kebab shop. Pace yourself - Your body metabolises an estimated 1 standard drink each hour, and when you’re drinking more than that your body can’t keep up. Try to stick to one alcoholic drink an hour. Order water - For every alcoholic drink you buy or pour, be sure to get a water too. This offsets the water losses caused by alcohol’s antidiuretic properties, and can greatly reduce the extent of your dehydration. Why not go one step further and mix soda water with your beverages. Avoid mixing alcohol with energy drinks - Alcohol is a sedative and too much of it makes you sleepy and tired - your body’s way of telling you you’ve had enough. Energy drinks delay this response by keeping you alert and stimulated for longer, which ultimately means you drink more. Red Bull might give you wings, but it can also give you one almighty hangover. Stay hydrated - Hydration is the most important rule when it comes to sensible drinking, as a large part of any hangover is the body’s lack of water. Prepare yourself before you go out by drinking lots of water, top up your water throughout the night, and add some electrolyte powder to a glass of water before bed to restore your body’s optimal fluid. When you’ve been eating healthy all year, it seems crazy to think that you’ll hover around the buffet come Christmas ... but that’s exactly what so many people find themselves doing. Christmas buffets and dinnertables have plenty of tempting options, and if you’re not paying attention you can quickly find yourself 10 mince pies deep. Eating before you go - Arriving at a party hungry is asking for trouble, so aim to eat something light before you go. That way you can still enjoy a couple of samples, but your chance of dining on high calorie party food all night is dramatically reduced. Packing your own snacks - If you’re visiting the family and are worried about the foods that will be on offer, pack your own nutritious snacks. Healthy snacks include tubs of reduced fat yoghurt, wholegrain cereal and trail mix. Watch your portions - If you’re watching your portion size, then Christmas doesn’t have to be about missing out. Remember, you shouldn’t be out to lose weight during the festive season - your goal should be to maintain it. If you’re worried about finishing everything that’s in front of you, fill a smaller side plate instead of a dinner plate. Exercise lightly after eating - Go for a walk after Christmas lunch, or play a game of cricket with the family to get yourself up and moving after that big meal! 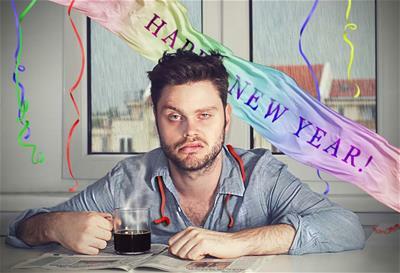 If you say yes to every single party and gathering, you’ll be a walking zombie by the time the New Year rolls around. Try to remember that it’s okay to say no sometimes, and try not to get too caught up in the Christmas hype. The expense of buying gifts, the pressure of last minute shopping, the heightened expectations of family togetherness - it can all get pretty stressful! Planning ahead - Work out a rough budget of expected Christmas costs as early as possible, and start saving a small amount aside each week. If you don’t have enough time to build up a good nest egg, consider re-budgeting your Christmas costs. Also try to buy early so you’re not having to squeeze in work and shopping before your festive soiree. Setting limits - Determine what you think is a reasonable amount of time to spend partying, and limit yourself to a selection of planned events. If the friends want to get together for an impromptu drink at the pub, say no. Take this time to chill out and recoup your energy. Delegating - If it’s your turn to host Christmas dinner, don’t try to tackle it on your own. Delegate tasks and get everyone to bring a plate. Also buy start buying non-perishable items a few weeks before the big day. Get some sleep - Plan for as many early nights as you can to make up for the late ones you’ll be having. Make your bedroom as comfortable as it can be to promote deeper sleep, and enjoy long lie-ins (or lazy morning snuggles!) when you can.